Baltimore Marriott Waterfront welcomes you with spacious accommodations, modern amenities and a prime location. 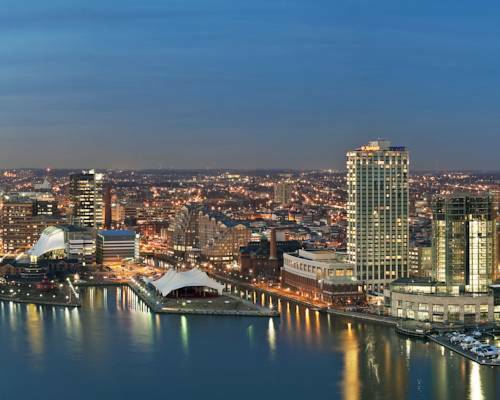 Our hotel is situated in the Harbor East area of the city, just a short distance from Inner Harbor; Fells Point and the National Aquarium are nearby, as is the Baltimore Convention Center. Make yourself at home in comfortable rooms and suites, which boast panoramic views of the city or the waterfront, as well as plush bedding, Wi-Fi access and bathrooms with soaking tubs and THANN amenities. Additional perks for your Baltimore visit include a 24-hour fitness center and a heated indoor pool. Stop by Apropoe's, our signature hotel restaurant, for innovative American dishes in a relaxed atmosphere. If you're hosting an event in the area, you'll appreciate our adaptable venues, some of which overlook the harbor. And if you're in the mood to explore, our convenient hotel location places popular attractions right at your doorstep. We look forward to your visit at Baltimore Marriott Waterfront. Apropoe's: Savor seasonal, locally sourced American cuisine at our waterfront restaurant. Stop in first thing in the morning to fuel up for a busy day in Harbor East, or join us for dinner and cap off a successful day in downtown Baltimore. Fresh Bites: Fresh Bites features handmade food without the fuss. Flavorful and convenient, our delicious meals can be eaten in your hotel room or on the go during your Baltimore visit. Call At Your Service from your room to place an order.